Earlier in the year, I met Aowen Jin at the academic conference ‘China in Britain’, an AHRC funded research network project ‘China in Britain: Myths and Realities’ run by Dr. Anne Witchard from the University of Westminster. She is a London-based artist whose practice often looks at the political social realities of China and their interpretations in their Western counterparts through performance, documentary and film. 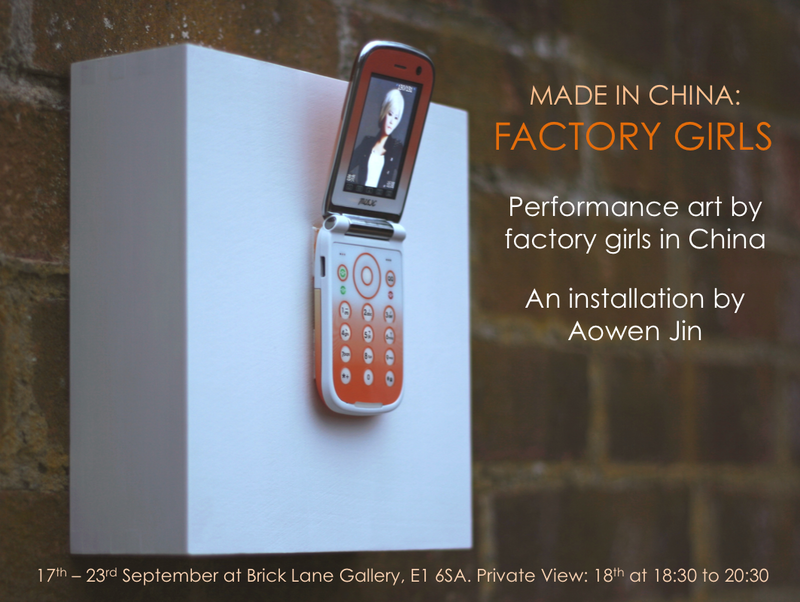 Her forthcoming exhibition ‘MADE IN CHINA: Factory Girls’ opens tomorrow, 18 September 2013 at 6.30pm, at Brick Lane Gallery. On show until 23 September 2013, it presents performance artworks by China’s factory girls captured and displayed on mobile phones. Aowen has spent the last two years meeting more than 800 factory girls in China’s biggest manufacturing cities, discovering the human stories behind these millions of workers who make the goods we use every single day. I bet if you pick something up from your surrounding right this second, nine times out of ten it will be “Made in China”. Looking beyond the often stereotyped media presentations and headlines of China, she brings to life a varied group of ambitious, dynamic and modern young people, whose personal aspirations are not too different from our own. For the show, the artist invited twenty factory girls between the ages of 16 to 30 to take part in the exhibition. These girls work in a variety of factories, making anything from iPhones to sofas for the Western market. Using art as a universal language, each girl was invited to communicate her ambitions and hopes to the audience through performance art. 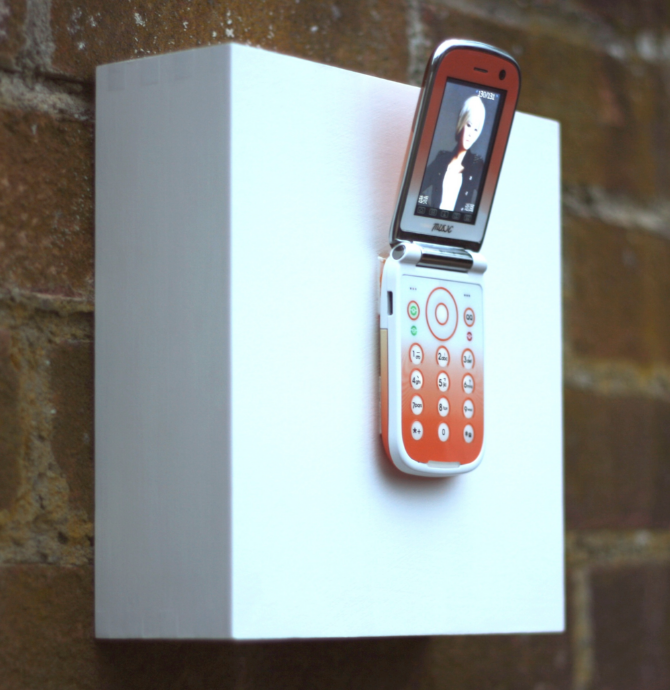 The performances were captured as photos and videos on each girl’s mobile phone, and the mobiles were shipped from China and installed for the exhibition. 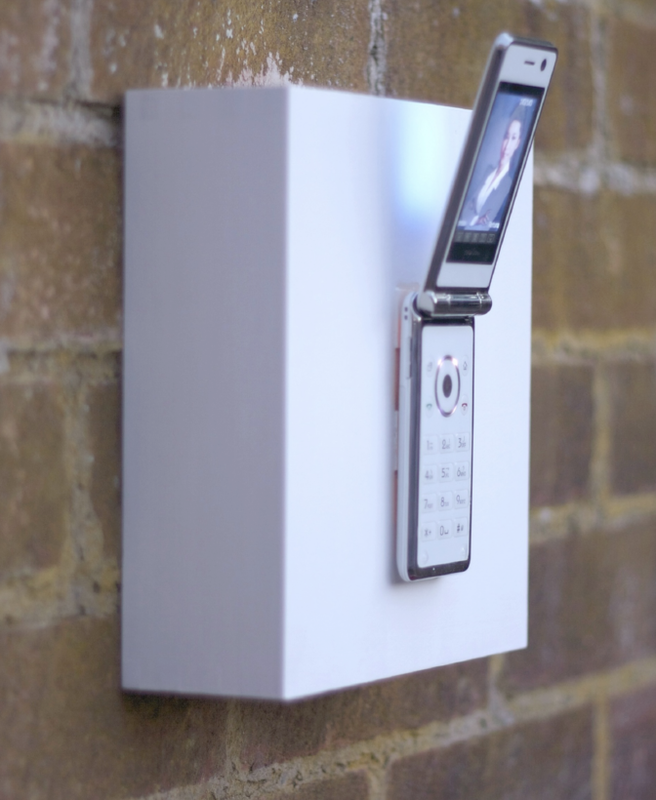 The viewers are required to navigate through each phone in order to view the performance, creating a personal and intimate encounter with each factory girl. By doing so, the exhibition attempts to enrich our understanding and reshape our perception of factory girls in China. A documentary titled ‘Beyond Mobiles and Uniforms, a trailer of which is show below, follows the making of the artworks and will be show alongside the exhibition. It includes rare interviews with factory girls, and commentaries from influential academic and cultural experts on China, including from Xinran, radio host and author of ‘Good Women of China’, and Martin Jacques, renowned author. Read and hear more about the project through the press coverage and interviews on Lucky Cat, BBC Outlook, Resonance FM and BBC China. I hope to meet with Aowen after surgery kingdom to discuss how we can share this project in addition to talking about performance art in China-UK contexts, and contemporary Chinese performance art in general, as I am currently researching material for a series of articles. It would also be good to flesh out more of the thematics such as the mobile phone as an artistic and curatorial platform, China’s relationship to mobile technologies and social mobility, the youth of China and their want to express themselves creatively, and the social impact of these new happenings…still very much embedded within the socio-political governmental power games. This exhibition is a snapshot, skimming the surface, of what the younger, female generation in China is currently thinking…feeling…wanting…what they are striving for, their dreams and ambitions, their possible future reality, in what is China’s Century. ‘Yuan Li’ by Aowen Jin. Image copyright the artist. ‘Kang Jiali’ by Aowen Jin. Image copyright the artist.